Defining well a mobile application project is very important so that developers can provide tight budgets and make their proposals through Yeeply. However, the other side of the coin is that it’s also very important for developers to know how to submit good proposals and display the designs they have in mind for future mobile apps properly. App prototyping is one of the simplest techniques to preview an app’s appearance and design without having to lay down a single line of code. Creating a prototype app is going to save us a lot of time and work and will also allow us to see very accurately the app’s future appearance. In addition, it will also empower us − if necessary − to optimise its design, appearance and user-friendliness, which are very important aspects of the app’s development. Thus, if the customer wants to make any change in the app’s design it will be much easier to carry it out straight away in the app prototyping tool. We can even create several prototypes so the customer can choose the one that’s more in line with what he has in mind. There is a wide variety of tools for mobile app prototyping available in the market. However, in this article we’ll be discussing the ones we consider to be very useful for defining a good app project and creating a prototype for the customer. It’s one of the most powerful tools available for creating interactive prototypes without having to lay a single line of code. It has both a free and a paid-for version and is available for Mac and Windows. This tool allows us to see how a webapp is going to look like. However, it’s not limited to this, as it also allows us to prototype mobile apps for iOS or Android. It’s very easy and intuitive, and enables us to create quickly a very accurate and effective prototype by importing images created with Photoshop or Fireworks. All we’ll have to do is add interactivity to the images we’ve imported. The free version of this tool will suffice if you’re a freelancer or just don’t need to create a prototype that’s too complex. However, if you want to polish your prototype further and make a good impression with it, don’t hesitate to go for Prototyper Pro. We’ve already talked about this tool on our blog. Concept Inbox is a tool for app prototyping that is more recent than the one we were previously discussing. It provides very good solutions to development teams and developers working on their own alike. We’ll tell you exactly how it works later on, as it’s certainly a very good choice for creating prototypes. One of its biggest advantages is that it’s available in Spanish, whereas most of these tools can usually only be found in English. Fluid UI is a tool which has not been discussed too much but that also proves to be very useful for app prototyping. Its key aspect is being an online tool that anyone can use to design a prototype app for mobile devices in a simple and intuitive way. Its design allows users to understand the environment easily and provides many options for conceiving an app’s design. Even though it’s quite simple, its editor will allow you to use different wireframes for different platforms − be it for Android or for any of the different iOS versions. 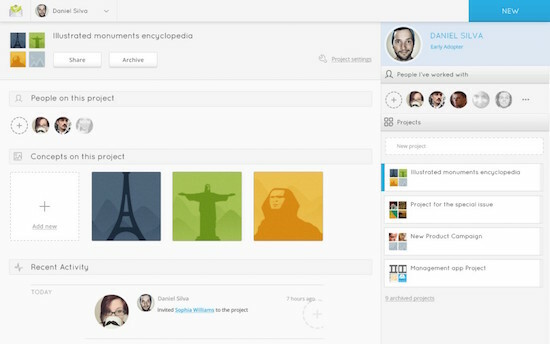 You’ll be able to create up to ten screens for your prototype with the free version. This may fall short if we want to design a complex app, but will work well for a simple prototype. If we require further features, we’ll have to sign up for any of the monthly subscriptions available. These start at $ 12 per month. Another of its qualities is that you can scan your prototype’s QR code and test it on Android and iOS devices. The tool also allows testing the design you’ve created. 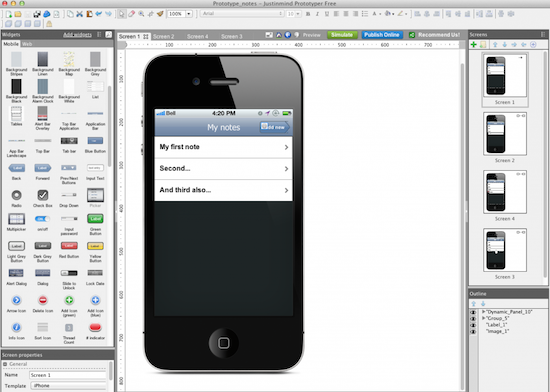 This tool seeks to provide app prototyping with a higher level of design. Its quality is a bit higher than that offered by tools as Fluid UI. However, it’s important to bear in mind that we can only try Antetype for free during 30 days. It becomes a paid-for tool thereafter. Even if comparisons are odious as the saying goes, this tool is similar in style to Keynote. It’s very simple and intuitive and it’s available for Mac exclusively. We can buy it either on the tool’s website or on Apple Store. Although the price may seem a bit over the top (€ 149), remember that − besides enabling you to create mobile apps − you can also design all kinds of websites with it. In short: it’s a very complete tool that you should try if you have the chance. In addition, the possibility it offers of downloading extra features is very interesting for iOS, Android and Windows Phone app developers. And also for developing websites. Believe it or not, NinjaMock is a tool with quite a reputation in the app prototyping scene. It’s an online tool in which the elements we incorporate have the appearance of freehand drawings. In terms of design, this may not be the best option for all kinds of applications, especially when considering the latest trends and the taste that app developers are showing for the so-called ‘flat design’. NinjaMock’s main advantage is that it’s completely free. However, one of its major problems is that the interaction it offers within prototypes doesn’t go beyond linking the different screens that the prototype app may have. Nevertheless, NinjaMock is more than enough as a tool to make a first draft. This is − without any doubt − one of the most powerful tools to be found for free. Invision enables the creation of full-on prototypes and goes beyond the simple sketches offered by other tools such as NinjaMock or many others. Invision’s biggest advantage is that it allows several people to work together like a team on the same prototype. With its free version you can only work on one prototype at a time, but with the paid-for versions you may have 5, 10, 15 and even up to 100 active projects. Furthermore, the team working on them can also be larger. Prices are relatively affordable, with monthly costs ranging from $ 15 to $ 100 depending on the version. This makes Invision more economic than Antetype, for instance. It’s highly recommended for small agencies and development teams made up of few members that usually work on a small amount of projects at a time. Invision is an ideal environment for collaborative app prototyping. There is also a Mac version available for synchronising any files you need. Remember that the options available are much wider and that there are many other app prototyping tools out there for you to discover. However, to create a prototype before you start programming is always a good option that will help you save time and allow you to show your customer how the app in development will be. To sum up, it’s a way to get an idea of the end result and gives us the chance of implementing several changes before getting started with the app’s main development work.